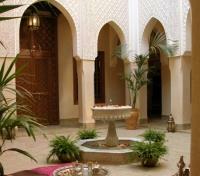 Private guided city and culture tours of Casablanca and Marrakech. Discover the traditional artisan’s quarter in Fes with private guide. Choose to hot air balloon, ATV, or horseback ride in Marrakech. 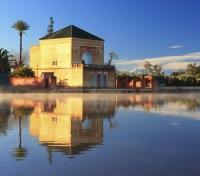 Explore the labyrinth of the Saadian Tombs with private guide. Spend nights in premium hotels. 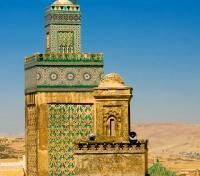 Travelers have long been seduced by Morocco’s unique architecture, vivid colors and dizzying labyrinthine medinas. With private guide and driver, you’ll discover the spellbinding treasures of Meknes, Casablanca, Fes and Marrakech. Captivate your senses with this elegant voyage through Morocco’s sun-drenched bazaars, aromatic spice markets, ornate palaces and magical mosques. 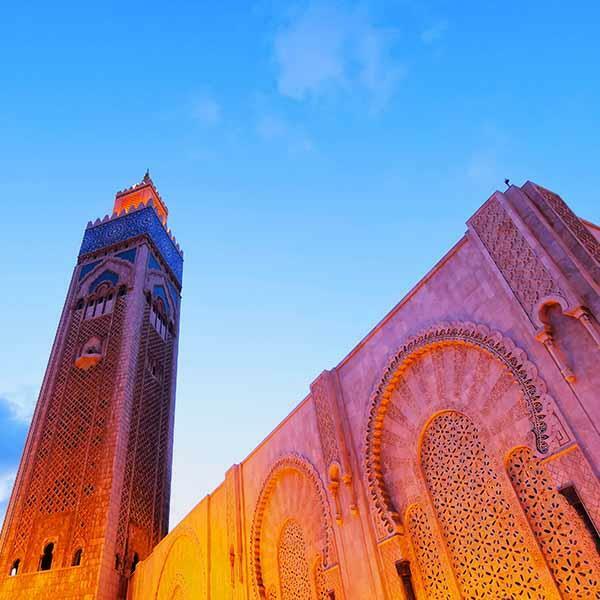 Explore the highlights of Casablanca and make your way to the Imperial City of Meknes, known as the “Moroccan Versailles.” Take in grand mountain vistas, desert oases and clay-colored villages in the stunning Atlas Mountains. 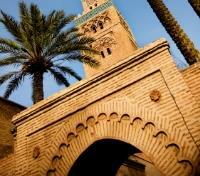 Stroll through the old walled medina of Fez and savor the scent of turmeric and cinnamon clinging to the arid breeze. As the sun fades beyond the horizon, witness Marrakech’s main square come alive with hypnotic performers, snake charmers, fortune tellers, belly dancers and bustling food stalls. 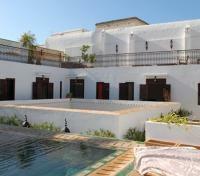 In the evenings, relax in a selection of charming riads tucked away on quiet cobbled streets. 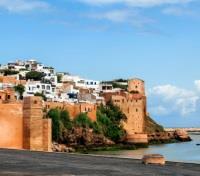 A private vehicle with English speaking driver will provide a transfer between Rabat and Fes. 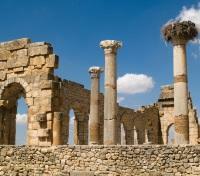 During the transfer, explore the Imperial City of Meknes along with the Roman city of Volubilis. In antiquity, Volubilis was an important Roman town situated near the westernmost border of Roman Empire. It was built on the site of a previous Carthaginian settlement from the third century BC. Volubilis was the administrative center of the province in Roman Africa called Mauretania Tingitana. The fertile lands of the province produced many commodities such as grain and olive oil, which were exported to Rome, contributing to the province's wealth and prosperity. Discover the Imperial city of Meknes known as the “Moroccan Versailles.” Meknes was founded in the 17th century by King Moulay Ismail. It is famous for its 25-mile-long walls. 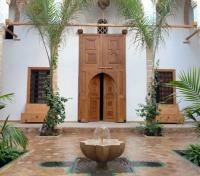 Upon arrival into Fes, a hotel drop-off is provided. Riad Salam Fes is conveniently located next to Batha square as well as other historical sites of Fez city (within walking distance from the historic sites of the Medina and the famous Bab Boujloud medina gate.) 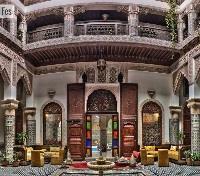 This remarkable riad in Fes' medina was built at the beginning of 20th century and was recently restored by craftsmen who managed to recapture the glory of its jaw-dropping interiors. The property itself is wonderfully atmospheric, with some of the finest zellij, plasterwork, carved wood and brass work that you can see outside of the tourist attractions – just the place to unwind in style. The small size of the property means that service is highly personalised, and the staff will do everything they can to ensure that your stay is perfect. They will also be more than happy to offer advice on places to visit, so that you can get the most out of your time here. 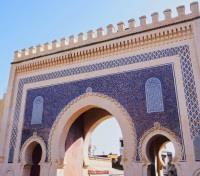 This afternoon set out to tour the labyrinthine souks of Fes with your private guide. Among the many shops and stalls are artisan workshops and studios where traditional skills, passed down by Moorish émigrés from Andalusia for generations, are still practiced by master craftsmen. Metal and leather workers, ceramic, silk, tapestry, and sculpting masters all congregate in the area, just as in centuries past. 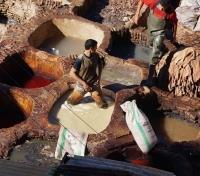 Highlights of the tour include visiting a vast open-air tannery and the spice souk known as El Attarine, undoubtedly the most vibrant in Fes, as well as the henna and wood-working souks located in the Nejjarine neighborhood where the heavy scent of cedar lingers in the air. Here, the main plaza is lined with trees that provide a welcome respite from the warm sun and is also where you can the city’s best fabric dyers. Wool and cotton are treated in colorful dyes here, and small streams of excess pigments float down the streets as finished garments are completed and rinsed. 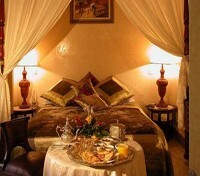 After a few hours navigating the Artisan's Quarter, you will be returned to your hotel. Dating from the 18th century, Riad Kniza is a small, luxury "Hotel de Charme" in the heart of the old Médina of Marrakech, completely restored using traditional materials and artisans to recreate an authentic Moroccan experience as in days gone by. Riad Kniza, with its tastefully decorated rooms and suites, is an excellent point of departure from which to explore the city. It is conveniently located within only few minutes' walk from the famous Jema l'Fna square, the wonderful souks and the most important monuments and cultural treasures of this imperial city, and a short distance from the Gueliz, the modern quarter of Marrakech. This elegant hideaway invites guests in with richly furnished suites surrounded by gorgeous cityscapes and views of the Atlas Mountains. 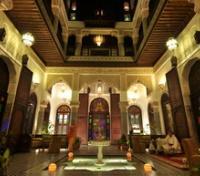 Here at this gem of Moorish art and architecture, you will enjoy a most memorable hospitality experience.